Here are three 20th-century violin concertos written within a 30-year period in three totally different styles, played by a soloist equally at home in all of them. Bernstein's Serenade, the earliest and most accessible work, takes its inspiration from Plato's Symposium; its five movements, musical portraits of the banquet's guests, represent different aspects of love as well as running the gamut of Bernstein's contrasting compositional styles. Rorem's concerto sounds wonderful. Its six movements have titles corresponding to their forms or moods; their character ranges from fast, brilliant, explosive to slow, passionate, melodious. 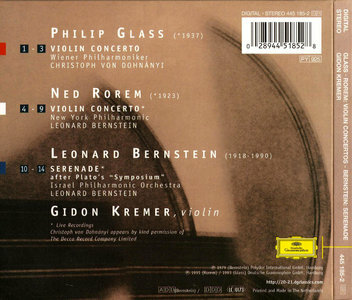 Philip Glass's concerto, despite its conventional three movements and tonal, consonant harmonies, is the most elusive. Written in the "minimalist" style, which for most ordinary listeners is an acquired taste, it is based on repetition of small running figures both for orchestra and soloist, occasionally interrupted by long, high, singing lines in the violin against or above the orchestra's pulsation. 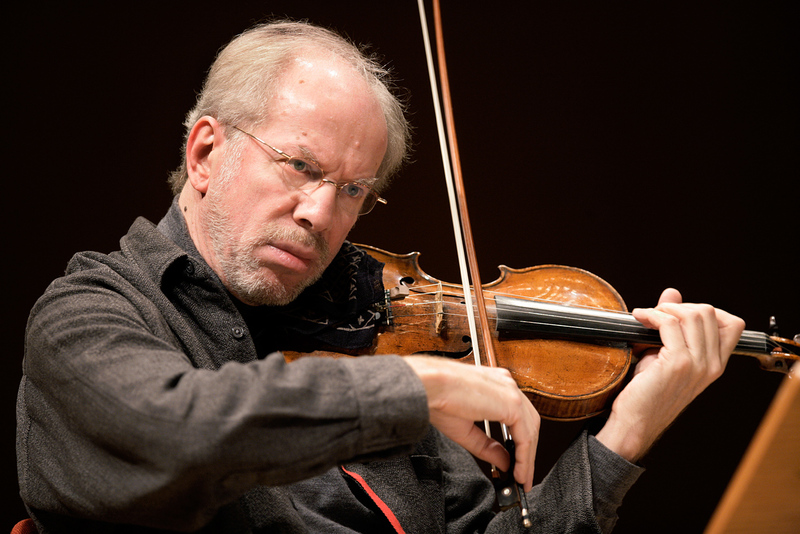 Gidon Kremer, well known for his championship of contemporary composers, plays fabulously; his tone soars, shimmers, and glows. His identification with the music is complete. This enviably crowded disc is part of DG's 20/21 Music of Our Time series which has invaluably given a new lease of life to some extremely significant and often challenging works recorded by DG since the 1960s. Modern music has never been a homogeneous quantity; at least not for most of the second half of the 20th century. While Searle was writing serial symphonies Hanson and George Lloyd were producing symphonies of an epic-melodic set. While Reich and Del Tredici wrote in various tonal idioms Elliot Carter produced works of Webernian asperity and Crumb wrote works that combined dissonance with romantic allusion. It has in fact been a very heterogeneous field although fashion, music promoters, record entrepreneurs and orchestral managements has tended ignore either one extreme or the other. Some composers have also evolved their styles in a consciously or unconsciously Darwinian way, tracking changes in the artistic consensus. Frank Bridge turned increasingly from tonality towards a new and more acid style between 1910 and 1925. He was not alone; listen to Elliot Carter's Symphony No 1 and the ballet Pocahontas and compare these with the Piano Concerto and the Symphony of Three Orchestras. Peter Maxwell Davies' extreme experimental banshee 'shrieks' of the 1960s and 1970s changed towards a more conformist, accessible though still distinctive, language in the 1980s from the First Symphony onwards. Philip Glass's concerto is in three movements and in mood is shaped by tradition. The orchestra used is to a normal specification. The work was written for Paul Zukofsky and the conductor Dennis Russell Davies, both prominent figures in the performance of modern music. The commission came from Davies' American Composers Orchestra. The character of the piece veers from railway rapping rhythms - all three unnamed movements - to Bachian velocity and purity. In the second movement, we experience the sort of heart-stilling inwardness and spirituality you find in the last twenty minutes of Allan Pettersson's Seventh Symphony. The finale boils with chaffing recollections of Herrmann's North by Northwest, Shostakovich-like vitriol darting and pecking virtuosity - a sort of waspish rumba. Rather like Reich's Variations and Nyman's Where the Bee Dances this work has the capacity to hold the attention of a very wide audience. Its contemplative prayer of a slow movement has deservedly achieved multiple playings on the UK's Classic FM radio station. It is a lovely piece (see reviews of the Naxos recording of the Glass concerto). 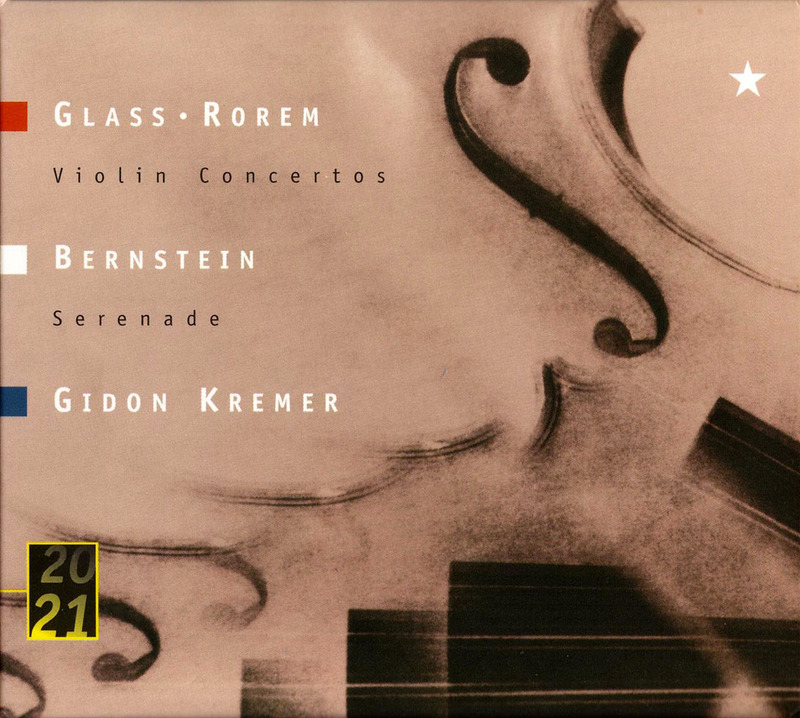 While the Glass reaches out to listeners bristling with rhythmic excitement, melodically memorable material and instantly engaging repetition, the Rorem is a slightly more resistant. Even so it is not forbidding. The lyrically singing core has a theme momentarily doffing its cap to Rozsa. The finale of Vaughan Williams' s Sixth Symphony is to be found in the Romance without Words which is marked 'hardly moving' - a pre-echo of the Glass slow movement. Samuel Barber may also be saluted by the woodwind writing at 2.23 tr. 8; indeed there are direct or caustically filtered reflections of the Barber style throughout. The concerto is in six sections rather like Rorem's Piano Concerto. This work, which has some wonderfully sensitive moments, probably has more long term staying-power than the instantly captivating Glass. The Rorem concerto belongs to Nantucket, off the Massachusetts coastline. The Bernstein was written thirty years before on another Massachusetts island, Martha's Vineyard. The movements are Phaedrus - Pausanius; Aristophanes; Erixymachus; Agathon; Socrates-Alcibiades. 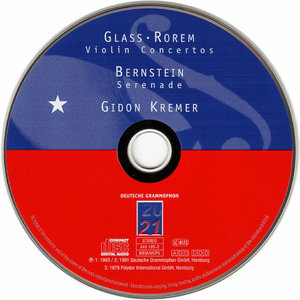 While the two concertos are for conventional orchestra, the Bernstein is for a string orchestra with harp and percussion. Perhaps curiously it is actually longer by five minutes than each of its two concerto disc-mates. In Phaedrus can be heard the first stirrings of the Maria love theme from West Side Story. Does the Aristophanes allegretto not betray, in the orchestral line, a familiarity with Pulcinella and also with Bernstein’s ground-breaking study of Mahler's symphonies? Erixymachus hurtles along at high speed delivering a thunderous hailstorm of impacts rather like the Schuman concerto. The Agathon Adagio is surely in touch with the Mahler 5 adagietto yet in the solo line looks out, in honeyed tenderness, towards the Barber Violin Concerto’s middle movement. The Socrates finale is the longest of the movements at ten minutes. At 6.02 it enters a sleazily louche atmosphere suggestive of a decadent La Valse. That episode has about it a touch of Stephan Grapelli in those records he made for EMI in the 1970s with Previn and Menuhin when they sold like hotcakes. At 8.35 the thundering march theme is identical to that in the second movement of Nielsen 5. All three works are heard in recordings taken from live concerts as you can hear from the cough at 1.10 in the Twilight movement (tr. 4) of the Rorem. The 20/21 series uses the so-called ‘digipack’ rather than the jewel case. A booklet with helpful and factual rather than pretentious notes is included. This slips into the left-hand pocket of the cardboard wing-fold case. None of these works are avant-garde, atonal or serial. All represent the melodic stream. The Rorem is the more dissonant of the three but is still rooted in a language allied to that of Barber and Piston. If you regard the Shostakovich second concerto as a tonal outlier there is nothing here as remote or as chilly as that. As for the Glass it will instantly and naggingly enter your whistling repertoire.